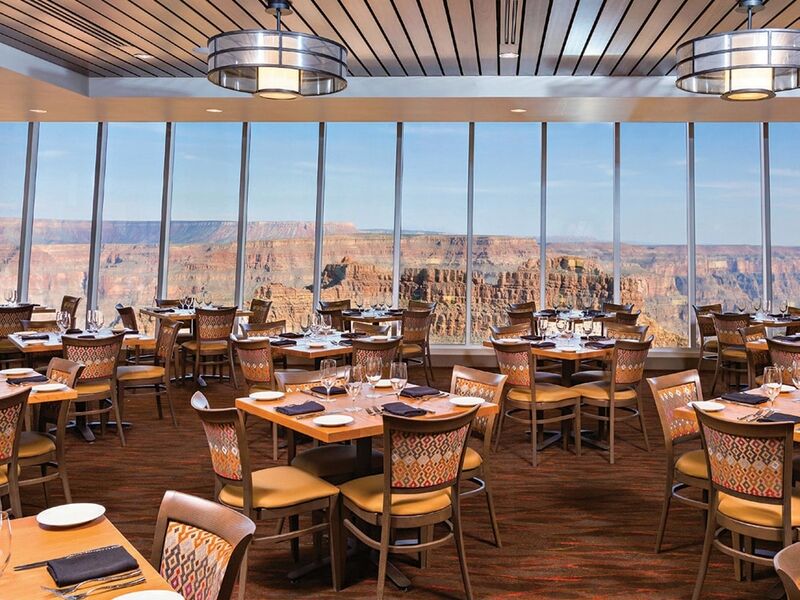 Fine dining and spectacular views at Grand Canyon West. Some 75 miles to the east of the Strip, one of the most spectacular dining spots in the entire Las Vegas region awaits. Sa’ Nyu Wa’s windows don’t look out onto stately palms or gushing fountains like its city cousins; rather, it has an unparalleled view into one of the Seven Natural Wonders of the World, the Grand Canyon. Located at Grand Canyon West in the Hualapai Reservation, Sa’ Nyu Wa is best reached through Papillon Grand Canyon Helicopters, a local tour company that offers the Heli Skywalk Tour with VIP Dining Package. It’s a full-service day that begins with a morning shuttle ride from Green Valley Ranch Resort’s porte cochere to the state-of-the-art Papillon Aerocenter in Boulder City. From there, it’s up into the clear blue Mojave Desert skies with a helicopter pilot as an aerial tour guide. Travelers are greeted with a hundred-mile view of the mountainous desert around Las Vegas and Lake Mead National Recreation Area, stretching into the riven horizon of the Colorado Plateau, where the namesake river scours out the immense Grand Canyon. After a vista-filled flight, Papillon’s helicopter lands at lofty Eagle Point, where guides from the Hualapai nation take over leading the tour. First stop: the famous Skywalk. This marvel of modern engineering is a stunning horseshoe-shaped union of stone, steel and tempered glass. Spanning 10 feet wide, it extends 70 feet out over the 4,000-foot-deep chasm. It’s a thrill unlike any other to walk over the transparent floor with a plunging landscape straight below and massive canyon walls in the distance. While visitors can’t take personal cameras on the walk (there are complimentary lockers at the entrance), tribal staff members are on hand with professional photographic gear to commemorate the moment. After the thrill of the Skywalk, it’s time to sit down in comfortable Sa’ Nyu Wa. Its menu is highlighted by dishes featuring ingredients found in traditional Native American cuisine. Cornbased fry bread, which is akin to a puffy tortilla, is the classic starter and is served with sweet prickly pear cactus-chipotle butter. Acorn squash soup with hunks of beef is a Hualapai favorite. Entrées in the historic vein include pan-seared quail with savory prickly pear-agave gastrique and pan-fried rainbow trout with brightly hued prickly pear beurre blanc. For a dessert with pre- Columbian roots, flourless chocolate decadence with cherries features cacao, another ingredient indigenous to the Americas. The menu also branches out into Asian dishes such as pad Thai, as well as steaks, burgers, wraps and salads. As a bonus to all the magnificent geography and delectable gastronomy, the VIP package offers extensive information on aspects of Native American history and culture, including museum dioramas in the Eagle Point visitors center and a nearby walking trail featuring replicas of Hualapai, Navajo, Hopi, Havasupai and Plains tribal residences. There are also daily Hualapai dances to be enjoyed, too, before helicopters return to the neon lights of Las Vegas.